Wood Products Corporation has qualified some of the finest suppliers of green hardwood and green softwood in the Midwest. Multiple species with multiple densities can be matched to your application to improve performance and reduce lumber costs. We currently provide industrial lumber for construction, concrete, piping, metal manufacturing, crane work, pipeline and export applications. We are able to offer our customers Western, Canadian and Southern pines, which allows us to purchase from the best markets. We can ship material directly from the mill or bring material to our facilities for stocking and remanufacturing - cutting, ripping or grooving to length. Whether the material is customer owned or provided by us, we can rip, re-saw, and cut to exact length (precision end trim) so your material is ready to be used when it arrives at your facility. Mill-direct or from our shop, we offer truck load quantities or cut panels. Custom drilling, beveling, and notching of panels is also available for your unique crating and pallet applications. 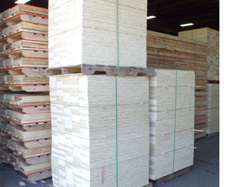 Plywood - a wide range from industrial grade CDX to A-Face plywoods.